Fulcrum offers a free trial period for you to test the full functionality of the product before determining which plan best suits your needs. Fulcrum subscription plans offer varying levels of functionality and number of members with a range of affordable prices so you can scale accordingly. Additionally, Fulcrum plans are billed monthly so you can scale your plan up when collecting data and then scale back down when not collecting data. This tutorial is intended to guide new users through account setup, app creation, data collection, sync, and export. We encourage you to follow along with this tutorial on your mobile device and in your Fulcrum account on the web. Go to the sign-up page and complete the registration form. After signing up, you will be given immediate access to your Fulcrum account. You will also want to check your email for the account confirmation link. 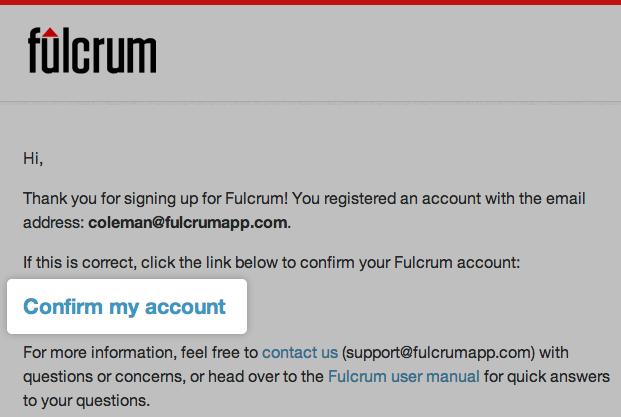 Open the email and click “confirm my account.” This will open a new tab with the Fulcrum web app. When you first access your account you will be presented with the main dashboard page of your trial plan. 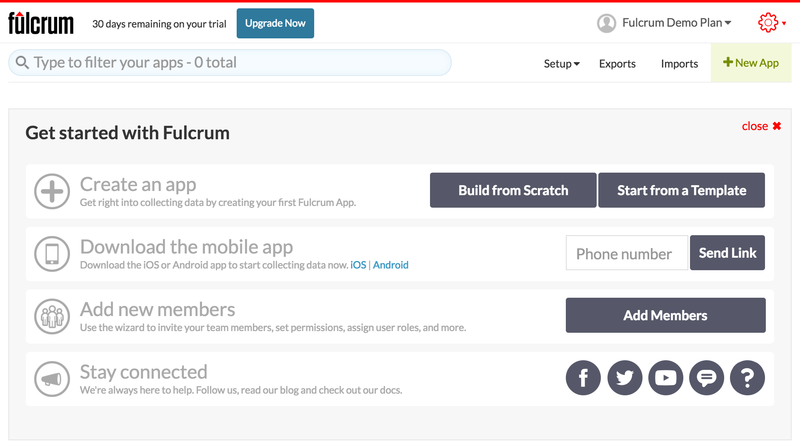 From this page, you will be able to access everything in your Fulcrum account. Since you do not have any apps, you will see an initial getting started overlay that can help guide you through your first steps. Fulcrum allows you to create your apps that are to be used to collect the data that is important to you. This will be covered in detail in the creating a new app section of this tutorial. Be sure to download the Fulcrum mobile application from iTunes or the Google Play store. The application is free to download. After the download is complete, be sure to sign in with the account you just created. This will be covered in more detail in a later step of the tutorial. To take full advantage of your trial time and see use Fulcrum in fullest you will want to add members to your trial plan. This page will take you directly to the add member page. You can also add members from the member management page. Field Types Explained: If you are interested in learning more about the various field types in Fulcrum, check out the next step in this tutorial.